The next big patch of Final Fantasy XIV will begin January 30 with the deployment of Rise of a New Sun, on PlayStation and PC, the update 4.2 of the MMORPG playable. Everyone loves to glamour their gear in an MMO, because sometimes your high level gear leaves you looking a bit silly with some questionable fashion choices. The Vira Ananta are getting some new quests with patch 4.2 so players leveling up their reputation with the Vira can enjoy a whole new storyline. Square Enix invites us to mark with red marker on January 30 in the calendar, and accompanies the announcement with an extensive trailer to put us in context. For the update, continuing the story introduced in the Stormblood expansion, it takes us to explore the homonymous main stage and includes new main and secondary missions, as well as a new cosmetics system. 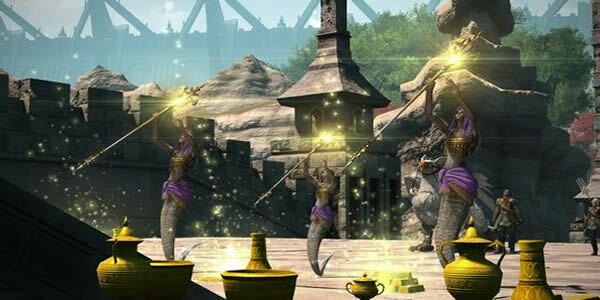 At FFXIV4Gil, we updated the full list for the patch 4.2, click here to know more. This update brings its traditional batch of content with to begin the sequel of the epic, whose events turn towards the Orient where the fragile state of peace is questioned. The side quests include the new adventures of the awesome Sir Hildebrand as well as the tribal missions of the Anantas Snake Woman, while the dungeons will lead us into the Underworld Lid and the Fractal Continuum in brutal mode. Square Enix announced today that in the face of the implementation of Patch 4.2 Rise of a New Sun, all servers. The new Omega: Sigma Metrie Raid from patch 4.2 Rise of a New Sun is a love letter to Final Fantasy VI with its boss battles. If you're looking for a place to buy Final Fantasy XIV Gil or FFXIV Power Leveling, and we recommend you to go to the best place: FFXIV4Gil.